“I think it [Screw’s music] does an amazing job of documenting,” explains Grob, who has a Masters in Library Science from the University of North Texas. “The neighborhoods where a lot of guys [like Screw] come from are places that are not documented the way historically African-American neighborhoods like Fifth Ward or Third Ward are,” she says, “because it’s marginalized people and reveals a lot around or about street culture and drug culture. “They didn’t have a more mainstream platform to put forward what they felt or were experiencing,” Grob continues. “The Screw Tapes really captured that. It didn’t come out of how record executives wanted to portray a sound. They were making the tapes for each other, about each other. Be sure to read the rest for more details about the collection, including information about specific items and about the March exhibit, “DJ Screw and the Rise of Houston Hip-Hop.” Check it out online or pick up your own copy of the Press. To inquire about donations, please contact Julie at jgrob@uh.edu. For updates about the exhibit and the Houston hip hop collection, follow Julie on Twitter. Today marks the last day of the Houston Astros‘ season, one that will go down as the team’s worst season to date regardless of the outcome of tonight’s game. It was a season that was historic in a way that teams don’t like to brag about, and as a relatively new team — they played their first season as the Houston Colt .45s in 1962 — the Astros don’t have a lot of history to look back on. 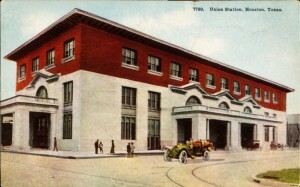 A postcard of Union Station in Houston long before the Astros started playing baseball on the grounds. One aspect of the team that is worth talking about is the history that lives on in its 11-year-old ballpark. That’s right, history in a ball park that hasn’t even reached its adolescence. Most fans outside of Houston know the stadium as Minute Maid Park (or, in it’s former life, Enron Field), but the locals also know it as the Ballpark at Union Station. That’s because the stadium was built on the site of Union Station, a railway station located at Crawford Street between Texas Avenue and Congress Avenue that was dedicated on March 2, 1911. 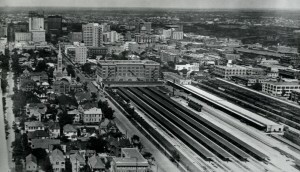 The railroad was vital to Houston’s growth and development, and Union Station was a key factor. Today, what was the station’s main concourse is now both the main entrance to the stadium and home to a conference center and executive offices. Astros team officials say that approximately 60 percent of fans enter the stadium through the Union Station lobby. An aerial view of Union Station looking west over the city. UH Special Collections holds photographs and illustrations of the original Union Station in the George Fuermann “Texas and Houston” Collection, which you see in this post, and which are also a part of the UH Digital Library. For a view of what Union Station looks like today, check out this picture from Wikimedia Commons. If you’d like to know more about the renovation of Union Station as part of the building of the stadium, take a look at this article from the Houston Railroad Museum. Wrecked houses submerged in sand on the east of Galveston on Seawall Boulevard after the 1915 hurricane. The Texas Gulf Coast could use the rain that a small tropical system would bring, but the threat of a hurricane hitting the Houston-Galveston area has likely — most would say, thankfully — passed for this year. Mid-September sees the peak activity of the Atlantic hurricane season, which officially ends on November 30. Many people know about the famous Hurricane of 1900, which hit Galveston on September 8, 1900. This large, powerful storm was responsible for the deaths of tens of thousands of people and holds the record as the deadliest natural disaster to ever strike the United States. 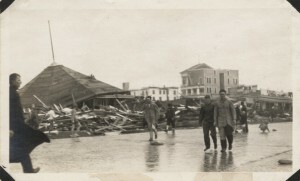 After the 1915 hurricane, pedestrians walk along the Seawall with wreckage from Murdoch's Bathhouse in the background. Following the storm, in 1902 construction started on the Galveston Seawall, meant to protect the city from future storm surges. Additionally, the elevation of the island was raised by up to 17 feet. These protective measures were tested in 1915, when on August 16 a devastating hurricane hit the island. In contrast to the 1900 storm, only 275 deaths were attributed to the 1915 hurricane. This low death toll, especially in contrast to the Hurricane of 1900, was attributed in large part to the protection given by the Seawall. 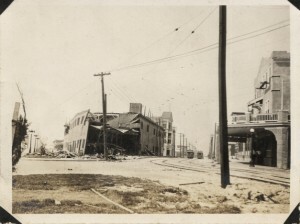 Damage from the 1915 hurricane is visible in this view down Q Street. 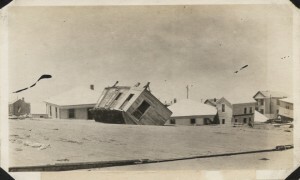 UH Special Collections has a collection of photographs of the 1915 storm’s damage. The photographs were taken by Rex Dunbar Frazier, an engineering representative called in to collect storm damage data and photographs. These photographs document the damage to streets, railroads and buildings and repairs in progress. 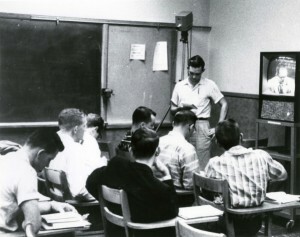 The photographs can be viewed in the Special Collections Reading Room, or take a look at them in the UH Digital Library. Two Houston publications ran stories last week about the DJ Screw Sound Recordings Collection, and we thought you might like to take a look! The New Semester is Here! The fall academic semester is here, and that means that Special Collections is now open on Saturdays from noon to 4 p.m. We will be open every Saturday except November 26. Our last Saturday of the semester is December 10. Our regular hours, in addition to Saturdays, are Monday – Friday, 9 a.m. to 5 p.m. We hope to see you soon!